Create and run your game with a global, secure cloud and game-specific services—for studios of all sizes and budgets. Dynamically scale your game experiences to over 50 global regions—more than any other cloud provider—on demand. Deliver your game to consoles, PCs, mobile devices, and the web. Powering games like Minecraft, Halo, and Sea of Thieves, Azure enables built-in virtual networking and load balancing. Plus, automatically sync between cloud and on-premises systems. Preserve the latency and integrity of your most demanding gaming workloads with the cloud that handles billions of game events each day. Protect your game from DDOS attacks with a self-healing platform that provides backups, rollbacks, and failovers—bolstered by a 99.99 percent availability SLA. Build and operate games with a single platform. Azure PlayFab gives you everything you need—managed game services, data analytics, and LiveOps tools—to launch faster, extend your game’s lifecycle, and reduce your costs. Improve the way you plan, collaborate, automate, and ship with an end-to-end set of modern DevOps services. Create more accessible in-game experiences with real-time moderation, translation, text to speech, and speech to text. Build cross-platform, multiplayer augmented reality apps with persistent 3D content projected in physical space. Build high-performance 2D and 3D games in DirectX, Unity, and Cocos, publishing to 21 platforms, including mobile, WebGL, Mac, PC and Linux desktop, web and consoles. Test and run your game on thousands of real Android and iOS devices, diagnose errors with ease, and release to app stores with confidence. Protect your game from Distributed Denial of Service (DDoS) attacks with always-on monitoring and automatic network attack mitigation. Exercise full control and creative license over your game environment with connectable components for custom server infrastructure, database solutions, analytics, and artificial intelligence—all in the cloud. Use game-specific managed services to operate servers with less effort and fewer resources, maximize player engagement, keep code and content fresh, find more monetization opportunities, and extend your game’s lifespan. Get detailed visual guides to integrating the back-end components for scaling and customizing game experiences and infrastructure. For studios with development and dev ops resources looking for a solution optimized to fully orchestrate microservices. Make the move from infrastructure to platform as a service. For studios that need the flexibility of hosting any variety of platform as a service solutions or other container-based solutions without the need for a DevOps team. 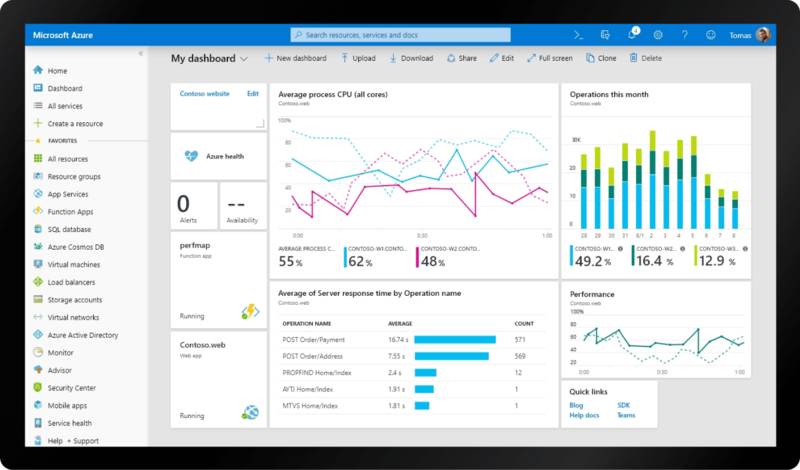 Let Azure manage it for you. Lay the foundation for a successful asynchronous multiplayer experience with a persistent database that saves the game state and push notifications to let players know it’s their turn. Improve your game as you develop with Visual Studio by piping gameplay data from a small sample of players into game engines like Unreal Engine and Unity. Open your game up to vision-impaired players with services that allow them to hear written messages and notifications. Rainbow Six Siege uses Azure to deliver immersive multiplayer games globally. Next Games handled over one million game downloads and 31 million gameplay minutes on opening weekend by implementing their backend services on Azure. Game Insight shipped a hit game built on open-source software and reduced their physical infrastructure by half. Tencent Games transforms the traditional front end of PC games into backend microservices using Service Fabric. lO-Interactive delivers Hitman as an episodic series and analyzes player behavior in real-time with Azure. Move your game to the next stage—no matter your team’s size—with a full technology stack that brings together the best of Microsoft game development resources. Game Stack includes Azure plus services like Visual Studio, PlayFab, DirectX, Havok, and Xbox. Host your game in the cloud, analyze and optimize live titles, reach the most passionate and engaged gamers on the planet—all with Game Stack. Get $200 credit to explore services for 30 days when you build or run your game on Azure. Store up to 100 GB of game data in a two-vCore MySQL general purpose database with seven days of backup retention. Scale your game on demand to run 20 million event-driven serverless game functions that take less than five seconds to execute on 128 MB of memory or less. Message your player base, sending 11 million push notifications to 10 million active devices.